Astra Expert Gel Effect 08 Argent Sable + comparison | Light Your Nails! Sembra davvero molto bello, a maggior ragione se somiglia ad Antiquated! Quando riuscirai a provarli non ne farai più a meno! Adesso dovrò guardare se lo trovo perché lo userei tantissimo per le mie nail art. Grazie per le swatches! E' vero, questo colore te lo godresti un sacco! Io li trovo nei negozi di cinesi, hanno gli stand sempre tenuti bene e con tutti i tester (del make-up, vabbè). The Astra polish is a great dupe of Color Club. Looks great on you! Great comparison! I have a few silver fouls and I live that they generally stamp really well. I think this one wouldn't stamp because it's not a one coater. This is such a great metallic. I'm not usually one for foil finishes but I like this a lot. 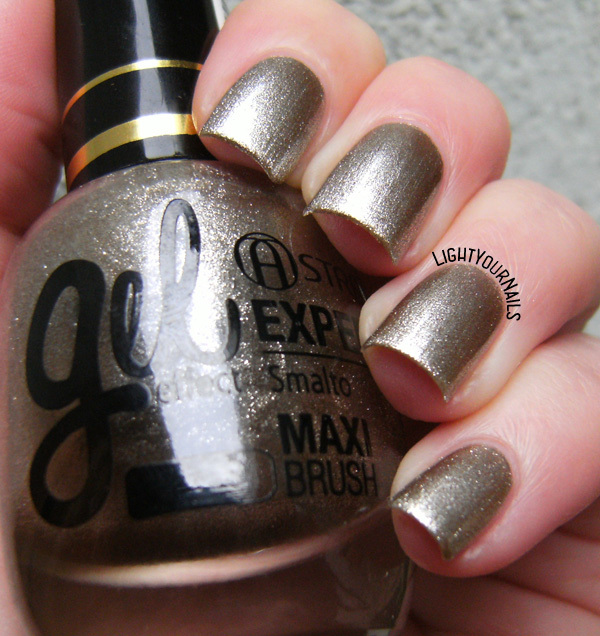 This is really pretty-- I loooooove a metallic foil! I like that Argent Sable has a slightly darker tone! That's a good thing Nichole! Thank you! Yeah, Astra is sold somewhere in Europe but I am pretty sure not overseas. Thanks for the great comparison! It's nice to know when a polish is close to another polish (or not). Thanks Jessica! This comparison will help my Italian readers mostly but I am happy to help when I can! Oh how pretty! I love how shiny it is! Very pretty! And thank you for the comparison, that is nice to know! I really love these finishes, especially for this shade.